Download the signature_pad.min.js file and upload it to the /wp-content/ directory on your server. You can use FTP software such as FileZilla to transfer files to your server, see this guide for help. Add a File Upload element to the form below the HTML element. This element will receive the signature image, give it a label such as “Signature”. 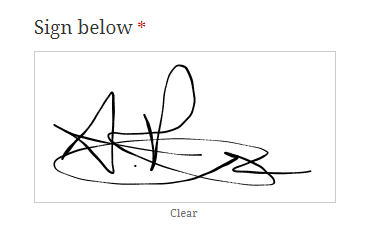 If the signature is required, enable the Required option. Go to Forms → Settings → Custom CSS & JS and at the Custom CSS (All devices) field enter the following code.